Do you love coole and refreshing York Peppermint Patties? 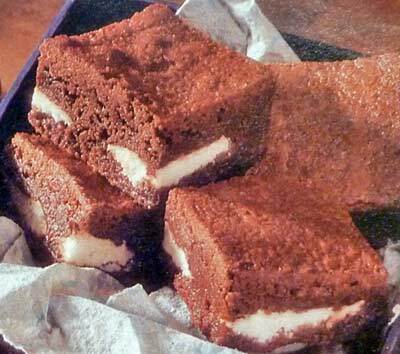 Then this is definitely one easy recipe you'll want to whip up for Peppermint Pattie Brownies. The dark chocolate covered YORK Peppermint Patties are made by The Hershey Company today and were mass-produced for the first time in 1940 by the York Cone Company. Initially, these chocolate and peppermint treats were only sold in the eastern part of the United States, but after Peter Paul acquired the York Cone Company, they started to distribute the YORK Peppermint Pattie nationally around 1975. This wildly popular candy (my Dad has always loved them), with the cool and refreshing peppermint enveloped by the dark bitter chocolate, is also currently available in a sugar-free variation. We promise, if you love chocolate and peppermint (and who doesn't? ), you will fall in love with these brownies! Remove wrappers from peppermint patties. Lightly grease an 13x9-inch baking pan and set aside. In a large bowl, stir together butter, sugar and vanilla. Add eggs and beat until well blended. In a medium bowl, stir together flour, cocoa, baking powder and salt and gradually add flour mixture to butter mixture, blending well. Arrange peppermint patties about 1/2 inch apart in a single layer over batter. Spread reserved batter over patties. Bake 50 to 55 minutes or until brownies pull away from sides of pan. Remove from the oven and let pan cool completely on a wire rack. This recipe makes about 36 YORK Peppermint Pattie Brownies.